As Oracle has been upgrading it’s JDK versions aggressively while Microsoft has dropped support for IE10 and lower, we would like to know what’s more important for ZK community: new features and improvements or backward compatibility. We have recently conducted a customer survey based on this, let’s find out how the community thinks! Summary 1: 49.1% of the respondents value new JDK features over compatibility while 43.5% of the respondents still care more about the compatibility. Summary 2: JDK 8 is extremely popular among the respondents, which is three times more than any other versions! Summary 3: 93% of the respondents will be ready to move on to JDK 8 before or when ZK 9 is released. Summary 4: There are still around 30% of the respondents need to support IE10 or lower IE versions. 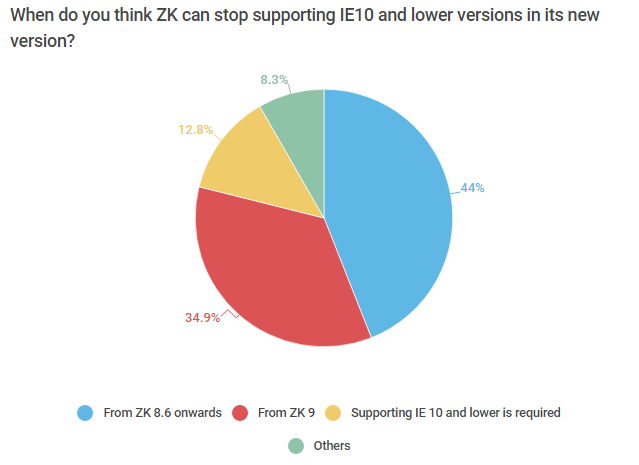 Summary 5: 79% of them think ZK can stop supporting IE10 and lower from ZK 9 while 21% of them think the support is still needed in the next 2 versions. 1. 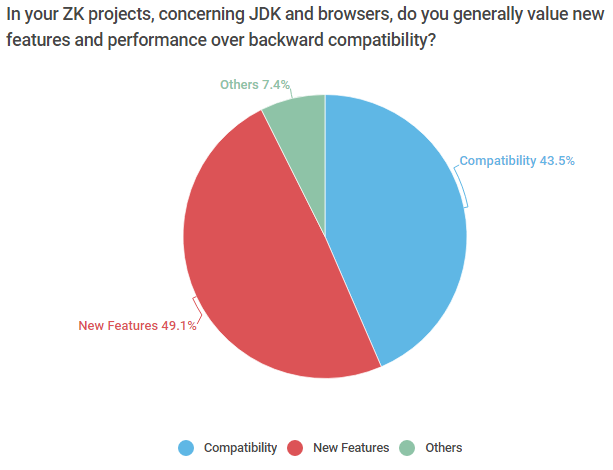 49.1% of the respondents value new JDK features over compatibility while 43.5% of the respondents still care more about the compatibility. 2. JDK 8 is extremely popular among the respondents, which is three times more than any other versions! 3. 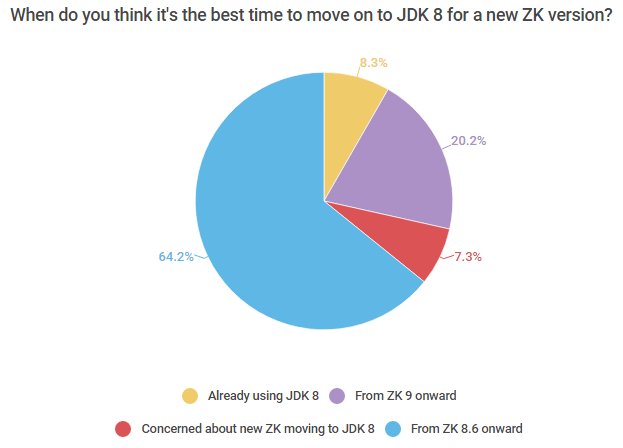 93% of the respondents will be ready to move on to JDK 8 before or when ZK 9 is released. 4. There are still around 30% of the respondents need to support IE10 or lower IE versions. 5. 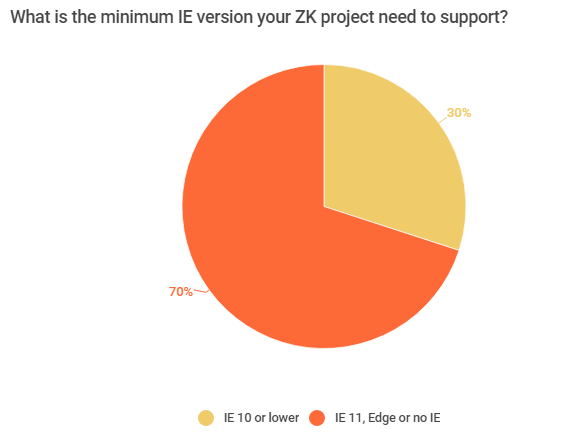 79% of them think ZK can stop supporting IE10 and lower from ZK 9 while 21% of them think the support is still needed in the next 2 versions. 1. Many respondents will move directly from JDK 8 to the next LTS JDK 11, and skip JDK 9 and 10. 2. 13% of the respondents are concerned about ZK dropping IE11 support, before IE11 is officially dropped by MS.
3. Most interested new JDK 9/10 features in the community are: new security features; modularization; new language features/type interface. How is ZK addressing this? 1. Latest ZK versions can be used with JDK 8, 9 and 10 already, only that the module system is not fully supported. There are no other known issues at the moment, if you found something feel free to report to us. 2. You can continue use your current JDK versions with ZK 8.6. However, we are also actively evaluating the possibility of upgrading minimum required JDK to JDK 8 in the coming ZK 9, if there is any major benefit. If any decision is made, we will announce ahead so that you can get prepared. 3. For the upcoming ZK 8.6 and ZK 9.0, we will not drop the support for IE10 and IE9. However, new components will be designed focusing on IE11 and modern browsers. The existing components will continue be compatible with currently supported browser versions. 4. ZK Team will continue evaluate the time-point and impact for stop supporting IE10. If there is any update we will announce ahead so that you can get prepared. I hope you find this information interesting. Huge thanks to the customers/users who shared their experience and feedback with us. Feel free to share with us you ideas in the comment below or contact us at info@zkoss.org.